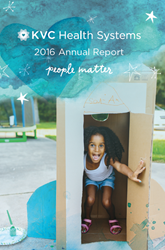 The full 2016 Annual Report will be online starting October 19 at http://www.kvc.org/2016report. The 2016 Annual Celebration will include a program beginning at 4:00 p.m. and a reception beginning at 5:00 p.m. Learn more at http://www.kvc.org/celebrate. KVC Health Systems, headquartered in the greater Kansas City area, is a private, nonprofit 501(c)3 organization committed to enriching and enhancing the lives of children and families by providing medical and behavioral healthcare, social services, and education. KVC’s diverse continuum of services includes in-home family support, foster care, adoption, behavioral healthcare, and children’s psychiatric hospitals. In its 46-year history, KVC has grown from a single Kansas home for boys to a national organization serving tens of thousands of children in five states and providing training and consultation internationally. KVC is endorsed by the Annie E. Casey Foundation as a best-practice organization and accredited by The Joint Commission, considered the gold standard in healthcare. Learn more at http://www.kvc.org.